Turkey’s temperate climate has long made it a beach favourite among holidaymakers, with myriad tourists flocking to its coastal areas every year. And what beautiful coastal areas they are too – bursting with personality and character with their carved rock cliffs and shapely dunes. Don’t believe us? Why not book a flight to Turkey and find out. But before you do, make sure you choose the beach best suited to you. The perfect stretch of coastline for one person isn’t necessarily perfect for another, so take a look at the suggestions below before you start slapping on the suncream and packing your bucket and spade. If you like to be alone and isolated during your sun worshipping, this is the place to be. Kobak receives barely a trickle of visitors every year, and with its tumultuous forest-covered rock rising out of the sea, it’s easily one of the most picturesque options on our list. The catch, I hear you say? (Because I have excellent hearing). Kobak is isolated because it is far away from the resorts. A mini-bus journey to the nearby village of the same name is necessary, and then a 30-minute hike. Worth it, though. Just an hour’s drive from booming Antalya, you’d think this would be absolutely heaving with visitors during high summer. It’s not the case though – Cirali is a pebble beach and therefore not nearly as popular with the seasonal visitors. Don’t be put off though – with the towering Lycian mountains serving as a backdrop, this is one of the most stunning beaches in the vicinity of the tourist resorts. For a buzzing beach that is chock full of tourists, atmosphere and friends just waiting to be made, Iztuzu is the place to be. A great choice for families as the kids will be able to run off and find other children to play with, the three-mile stretch of hard-packed sand makes this one of Turkey’s finest beaches. The beach is accessible by road, but you’ll find it easier to access Iztuzu by one of the regular boats that make trips from the nearby harbour. Return trips cost just £3.58. One for the history buffs and geologists, accessing the three beaches of Phaselis is not an easy task. You’ll need to pay £3 to enter the ruins that straddle the coast in order to get to the sand, and that’s after the hour’s drive from south-west Antalya. A quick hike through the dappled shade of the pine trees and you’ll be ready to collapse for a well-earned rest on the shore. 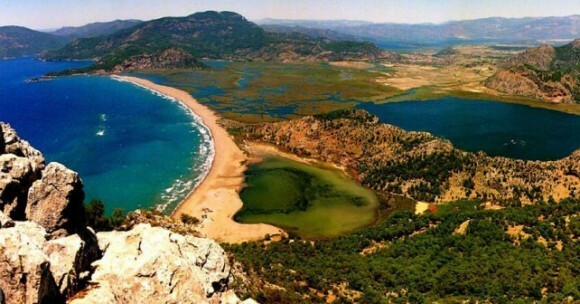 Located in Xanthos Valley, the fine white sands of Pantara stretch for nine kilometres, making it one of the largest beaches in all of Turkey. The immediate entrance to the beach area gets rather crowded, as you might expect, but a short walk in a northwesterly direction and the crowds should start to thin. Perfect for those who like company on their beaches, but prefer to choose how dense the crowds are.